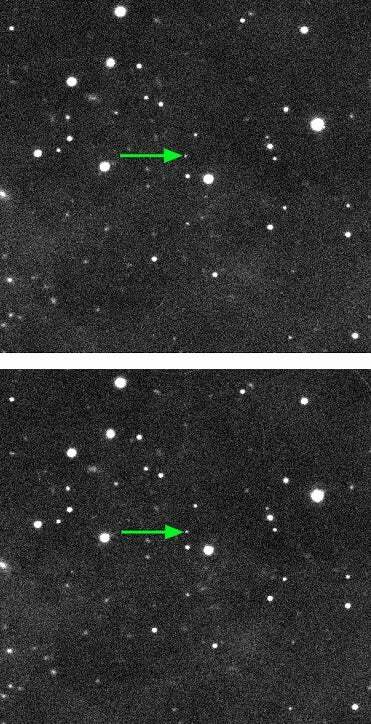 A team of astronomers has discovered the most extreme trans-Neptunian object in the outer reaches of the Solar System. Dubbed “Farout,” the object is more than 120 times farther from the Sun than Earth is. Excitingly, given preliminary estimates about its size, it could actually be a dwarf planet—but it’s still too small to qualify as the elusive Planet X. The newly discovered object was announced earlier today by the International Astronomical Union’s Minor Planet Centre. Many more years of observations will be required to fully characterise the object and its orbital path, but the IAU has added it to its database under the provisional name 2018 VG18, along with its coordinates and observational notes. Farout, as it’s been nicknamed, was discovered by astronomer Scott S. Sheppard from the Carnegie Institution for Science and his colleagues at the University of Hawaii and Northern Arizona University. Farout was first observed on November 10, 2018 by astronomers using the Japanese Subaru 8-metre telescope located atop Mauna Kea in Hawaii. The object was re-observed in early December with the Magellan telescope at the Las Campanas Observatory in Chile. These multiple observations, in addition to confirming the object, were used to establish its path across the night sky, along with its size, brightness, and colour. 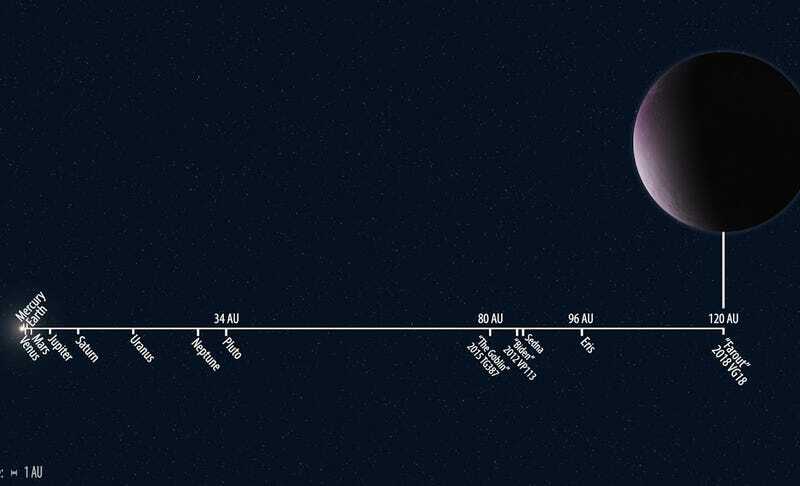 This extreme trans-Neptunian object is about 120 astronomical units (AU) from Earth, where 1 AU is the average distance from the Earth to the Sun (about 92 million miles, or 149 million kilometres). Farout is so far out that light from the Sun takes 16 hours and 40 minutes to travel the 11-billion-mile (18-billion-kilometre) distance. Sheppard and his colleagues wouldn’t be surprised if a single year on Farout lasts more than 1,000 Earth years. Pluto, by comparison, is about 34 AU from the Sun, so Farout is 3.5 times more distant. Other extreme trans-Neptunian objects include Eris at 96 AU and Goblin, which was discovered earlier this year, at 90 AU. Astronomers don’t know much about Farout’s physical characteristics because it’s so faint. Farout was discovered as part of the search for the elusive Planet Nine, sometimes called Planet X. This hypothetical planet is thought to exist in the outer reaches of the Solar System because of the way other Kuiper Belt objects are orientated. But as Sheppard pointed out, Farout doesn’t qualify as Planet X, which is thought to be much bigger. It’s reasonable to wonder how this object managed to stray so far from the Solar System’s planetary pack; astronomers won’t know the answer to this question until Farout’s orbit can be determined. Either result would be exciting; the first would help us to better understand the history of the Solar System, while the second would offer added proof that Planet X actually exists.